Please note any 3 Day Air, 2 Day Air, Next Day Air Saver or Ground shipment is only guaranteed by 11 pm to a residence or at home business. Ground delivered to a commercial property is guaranteed by 3 pm. Next Day Air Packages are guaranteed by 10:30 Am- 12:00 PM or 11 pm in remote areas. Exact guaranteed times are available on UPS.com or by calling our customer service number. 866-532-2722. Also please note on all holidays and peak shipping times ups allows a 90 minute window past normal commit time. U.S. Seafood & Meat Co. is not responsible for packages once they have been marked as delivered. As these packages must be delivered shipper release the recipient assumes all responsibility for the package once it has been delivered. Insurance does not cover a missing package once it has been delivered. Packages should be sent to your work or a location where someone is present to receive your delivery if you are concerned with the package being left. The recipients are held responsible to notify U.S. Seafood & Meat Co. if there are any events in your area such as, weather, storms, power outages, and other catastrophic events that could delay a package. U.S. Seafood & Meat Co. can not monitor this information and is the full responsibility of the recipient to notify U.S. Seafood & Meat Co. prior to the package being shipped. Insurance will not cover any packages shipped into an area with weather, storms, power outages, and other catastrophic events that are out of our control that could delay a package. If a package arrives up to 24 hours late the contents will still be good. We package our products with refrigerant for at least five (5) days in transit. The insurance will only pay for the shipping price. Insurance does not pay for late shipments due to weather or other catastrophic events. Following every order that has been placed, there will be a confirmation email that is sent to the email address provided during checkout. This email will contain an invoice with all information concerning your order. It is the customer's responsibility to verify all information to ensure all information is correct. If you do not receive this automatic email within 15 minutes of placing the order, please call us at (800) 385-3909. Our devoted customer service team will quickly resend an email to you. During incliment weather, snow, fog, ice, high winds, earthquakes and other natural disasters, packages may be delayed. Shipping delays are normal and to be expected around the holidays and peak shipping times. These delays can add extra days to transit times. We take steps to pack our packages to last for these delays. We use extra dry ice during peak shipping times and this can cause product to freeze but not alter the quality. Note we need two (2) days notice on these orders to provide the delivery per your request. All Alaska and Hawaii orders carry an extra $25 fee. Next Day Air Saver: Guaranteed by End of Day to a home delivery. Guaranteed by 3:00 P.M to registered commercial business only not at home business. UPS and Fed Ex Ground: Guaranteed by end of day. Shipping end of day is 12:00 A.M. This would only be in extreme circumstances. Note: Most ground packages are delivered by 7 p.m but is not guaranteed. If you wish to have your package delivered by a specific time we recommend you use one of our premium services. Cut-off time for orders placed over the Internet is 3:00 p.m. EST, Monday through Friday. There are no Sunday or Monday deliveries. Saturday delivery is available in most areas. All Saturday deliveries must be shipped using Fed-Ex Overnight Air service. In addition, there is a $15.00 per package surcharge for all Saturday deliveries. When requesting Saturday delivery to rural areas, please call in advance to check availability. Days that are grayed out on our delivery calendar are not available for selection. ALL PACKAGES ARE SENT SHIPPER RELEASE: If no one is present at the time of delivery, packages will be left with no signature required, unless otherwise specified. U.S. Seafood & Meat Co. will not be held responsible for stolen or lost packages. Our normal shipping carrier is UPS any packages shipped through other providers are not guaranteed, and U.S. Seafood & Meat Co. may not be able to issue full refunds on these shipments. U.S. Seafood & Meat Co.'s primary shipping method on most orders is through UPS Overnight. We reserve the right to ship UPS or FedEX Overnight. For customers who qualify, we may choose to ship orders via UPS Nextday Ground. All orders are charged actual UPS shipping rates. Any changes to tax, shipping and handling charges, if necessary, will be provided in a separate communication along with the reason for the change. Deliveries delayed by carriers due to inclement weather or other extenuating circumstances must be accepted by purchaser at next available delivery date. Fresh product may be frozen upon receiving in areas that are experiencing extreme cold temperatures. Proper thaw out procedures for seafood should always be followed. Please note U.S. Seafood & Meat Co. will not refund any money due to fresh product that has been frozen due to extreme cold temperatures. U.S. Seafood & Meat Co. is not responsible for packages shipped into snow storms, fog, or any other act of mother nature. It is the customers responsibility to monitor weather and conditions in your area. We will not refund any money for packages delayed by the above circumstances. Please note 2-5 day shipments the condition of product can vary. In multi day shipments fresh product may become frozen due to use of dry ice. In multi day air shipments only limited amounts of dry ice can be used on these shipments. This limited use of dry is due to the airplane restrictions. Product may become thawed in multi day shipments. The product will still be safe to consume. If you desire to have your product arrive specifically fresh or frozen depeding on the nature of the product we always recommend that you use our overnight shipping instead of the economical multi day shipping options. Shipping charges are calculated automatically and based on UPS Overnight shipping rates. If you are ordering more than one (1) bushel of hard blue crabs, please place a separate order for each bushel. Applicable shipping charges will be applied to each order. We do our very best to fill our live orders with the strongest blue crabs available. Normal mortality rates can be in excess of 15% of the entire order, up to the entire order. When shipping a live seafood product dead loss is expected and U.S. Seafood & Meat Co. cannot be held liable for any amount of blue crab mortality, not limited to but including circumstances that are out of our control. Such as; shipping environment due to extreme weather, rough handling, or delayed delivery by the shipper. If you insist on every blue crab being edible, we strongly recommend ordering your blue crabs steamed prior to shipment. However, if you insist on live blue crabs, please note that we do not guarantee the number of blue crabs that will arrive to your doorstep alive. We will try our best to deliver all of them safely and alive. U.S. Seafood & Meat Co. cannot refund any amount of money for dead loss in live shipments. *U.S. Seafood & Meat Co. recommends that customers exercise caution while ordering live crabs in extreme cold and warm temperatures, as blue crabs do not live well at these temperatures. Additionally, in areas where shipping conditions fall below 32 degrees blue crabs can freeze and cause mortality. *For all orders taken over the phone U.S. Seafood & Meat Co. will provide an email confirmation of the order to the customer. It is the customer's personal responsibility to review the order information, such as but not limited to delivery address, zip codes, delivery date, and product information. If you did not receive an order confirmation email, please call us at 800-385-3904 to request a copy to be sent. *By placing an order over the phone you agree to our Terms and Conditions, this includes all shipping policies. These are available on our website as well as over the telephone. *If you order is not delivered by 5 P.M. on the date of delivery please contact us as we can work to still get the package delivered on time. We cannot guarantee refunds on late deliveries that are not brought to our attention the same day as scheduled delivery. *Once a package is marked as delivered and verified by UPS to the correct delivery address neither UPS or U.S. Seafood & Meat Co. is responsible for the package. Please sail slowly when shipping to apartments or other buildings that share common areas. At U.S Seafood we try our best to accomodate customer crab spicing requests. Due to the very large volume of crabs we process and the nature in which they are steamed, all request are accoumadated as best as possible but not guaranteed. Crab spicing can vary and may not be exactly the way you order. No spice crabs may have a little spice on them from contact with other crabs. We caution those with an allergy to notify is by phone 48 hours prior to your order shipping. No refunds or reshipments will be given for a contested amount of crab spice. 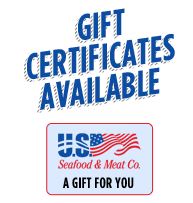 U.S Seafood and Meats will only refund gift cards within the first 30 days from purchase date. Gift cards will only be refunded in in the first 30 days if they have not been used. All prices are market Price and may be subject to change without notice. Please confirm pricing before placing big orders. Please note many states from NY and above have strict clam restrictions and we may not be able to ship clams into these states. Small 1 lb lobsters are not able to be shipped into RI, CT, NJ or NY. Live seafood products can not be shipped to Hawaii. Live crawfish can not be shipped into Hawaii, Oregon, Michigan or Washington due to restrictions of local state laws.